I checked out Barney’s style expert online magazine – The Window – and here’s five favorite stories I wanted to share with you guys. From how to recreate the runway beauty lookbook at home to how Barney’s fashion director packs beauty must-haves for weeks on the road. In the Olympics of fashion, model Kaia Gerber just won the gold: a stunning campaign with Chanel Beauty. The bold-browed 16-year-old model was genetically blessed for runway success with Cindy Crawford as her mother, but she landed this major sponsorship all on her own. Define your cheekbones like Kaia’s by applying bronzer in the hollows of your cheeks. NARS Bronzing Powder in Laguna $40 is a classic long-wear formula we love, or try the creamier Sun Wash Diffusing Powder $40 in the same shade. Blend it toward your hairline using the Claudio Riaz Face Contour Brush $65, which is shaped to hug your cheekbones. Thank legend Pat McGrath for the gorgeous makeup at the Calvin Klein show. Here, Kaia’s skin looks clean and bright with a soft-pink cheek. Start with the Sisely Paris Instant Correct Color Primer $90 to even out your complexion and add radiance. Then dust Armani Cheek Fabric $48 to the apples of your cheeks. The thin-textured powder is buildable, so you can achieve a natural après-ski flush. STREAMLINE YOUR BEAUTY ROUTINE – Three things to take advantage of when packing a neat and tight toiletries case: travel kits, sheet masks, and makeup palettes. Barneys stocks tons of mini versions of your favorite products, such as this skin and hair set from Malin+Goetz. It’s good to have when you’re not sure what kind of shower setup you’re walking into; plus, they come self-contained and are spill-resistant. 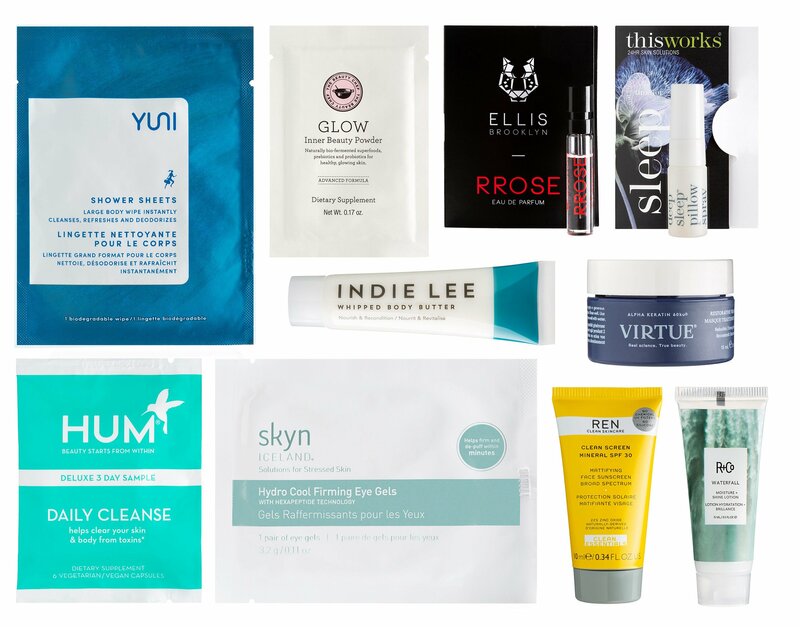 Meanwhile, sheet masks give you a dose of moisture at your skin’s driest time: air travel. And once you use them, they can be disposed of—which means one less thing to hold on to. Makeup palettes simply cut the clutter. There was palpable energy pulsing through Barneys in Beverly Hills yesterday as Madonna fans gathered in anticipation of an in-store appearance from the pop legend turned beauty mogul. There was no doubt the moment she was officially in the house—mobile devices were raised and the crowd swelled with joy, some screaming her name and a few even wept. Flanked by bodyguards and devoted fans, by the time she made her way to her MDNA SKIN counter, the crowd was at fever pitch—but the moment she opened her mouth there was a hush. “I’m a soccer mom, a party planner, and now I’m a sales person too!” she joked. “OK, so who wants some product? !” Needless to say, the crowd went wild. MDNA Skin $15 – $250. The mist is $120. The Ritual Kit with her signature is available online here for $1025. I used Armani Luminous Silk Foundation in Light Sand $64 and YSL Touche Éclat in 4.5 $38 under the eyes. I used Kevyn Aucoin Sculpting Powder in Medium $44 to give depth to the cheeks and Clé de Peau Beauty Eyebrow Pencil in 201 Dark Brown $25 to enhance the eyebrows. To create the dramatic eyes, I used hand-cut gold-foil eyeliner. You can recreate that look using YSL Couture Mono Eyeshadow in 12 Fastes $30 with a wet eyeliner brush. Underneath, I blended Chantecaille Earth Luster Glide Silk $30 Infused Eyeliner in the lower lashline. I curled the lashes with a Troy Surratt lash curler $30 and followed with the Chanel Inimitable Waterproof Mascara $32. I used Chanel Rouge Allure Velvet Lip Color in Libre $37 on the lips. I tried WelleCo The Super Elixir in the recommended method of mixing two teaspoons into one cup of filtered water. I later experimented with almond milk and blended the formula into banana smoothies. While The Super Elixir absorbed easily into any beverage of choice, it needed to be consumed quickly before the fibrous ingredients could separate. WelleCo’s SUPER ELIXIR is designed by leading nutritional doctors using carefully formulated ingredients derived from 45 premium wholefoods. Finalist in the 2018 Fashion Group International Rising Star Beauty Entrepreneur Award, Tatler Magazine UK’s 2017 Top 10 Beauty Product of the Year, Harper’s Bazaar Magazine AUS’s 2017 Bazaar 100 of the Best. Overall, with The Super Elixir 30-day challenge I felt more energized, less bloated, and saw my complexion clear up within the first two weeks. With supermodel Elle Macpherson as inspiration, I hope to stick to this routine. I may even get creative and incorporate some chocolate via WelleCo’s flavored protein—an added, delicious bonus. Barneys NYC – see all new Barneys beauty gift with purchase. Free shipping all order.